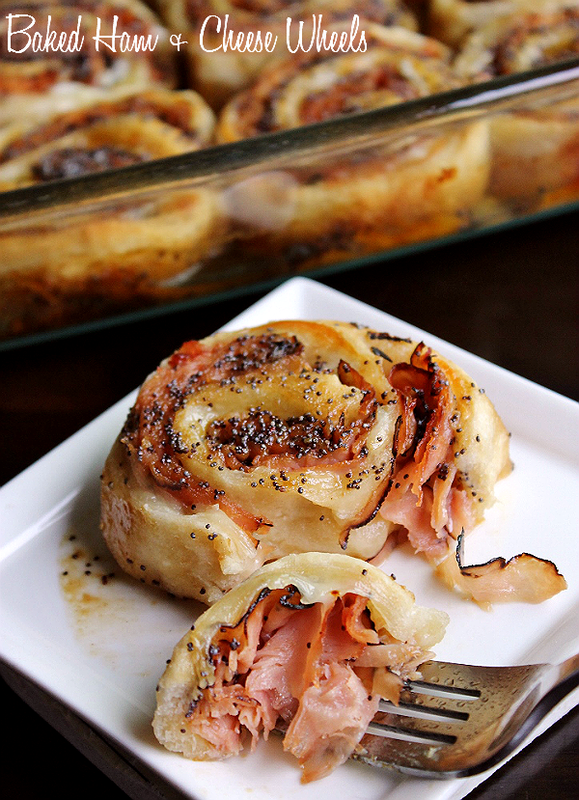 Momma Told Me: Baked Ham + Cheese Wheels, They're What's For Dinner Tonight! 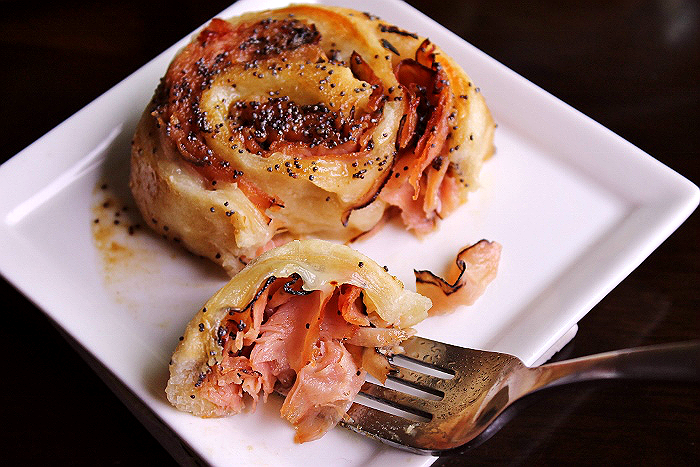 Baked Ham + Cheese Wheels, They're What's For Dinner Tonight! Momma Told Me: I don't have all day to stand around in the kitchen! Some of my favorite childhood dishes were meals Momma whipped up with leftovers and a bit of ingenuity. They were haphazard, unlikely, meals that quickly became favorite weeknight solutions for their touch of gluttony and simple composition. There were the Tuesday night trash tacos made of just about any meat, veggie, or condiment Momma happened to have lying around in the fridge before doing the week's grocery shopping the following morning. Sometimes these 'tacos' included frozen chicken nuggets, flattened slices of bread ('tortillas') and even leftover Hamburger Helper. But my favorite was always the impromptu Bagel Pizza nights where I could build faces out of cheese and veggies under the premise we were having a family pizza night. My point here, folks, is that meals are what you make of them, quite literally. Whether you're a busy mom just trying to serve 3 squares a day, or a laid back millennial trying to find the motivation to cook for just 2 when reaching for TV trays seems so much more simpler. It's nice to sit down to a fine dining experience at home, from time to time, but it's equally as rewarding to know you didn't slave over a meal and it still turned out amazingly delicious. The secret? Minimal ingredients- the less ingredients you have to handle the more you can enjoy the flavor of each individual ingredient, the less time you spend handling the food in the kitchen. Refrigerated dough can be a lifesaver, providing countless meal hacks for the modern home cook. Did you know you can even get flat sheets of rolled 'pizza' dough in the cold case at your local supermarket? This past week Black Forest Honey Ham was on special at our neighborhood deli and I picked up a pound shaved extra thin for one of my favorite quick fix meals; Baked Ham + Cheese Wheels. I prefer the flavors of ham and Swiss, but you can also pair White Cheddar or even Provolone to suit your own tastes. Preparation is as simple as rolling out a refrigerated pizza crust into a rectangular shape, layering ham and cheese, and rolling tightly. Next cut 1.5" sections off of the roll and place your prepared wheels into a casserole baking dish. 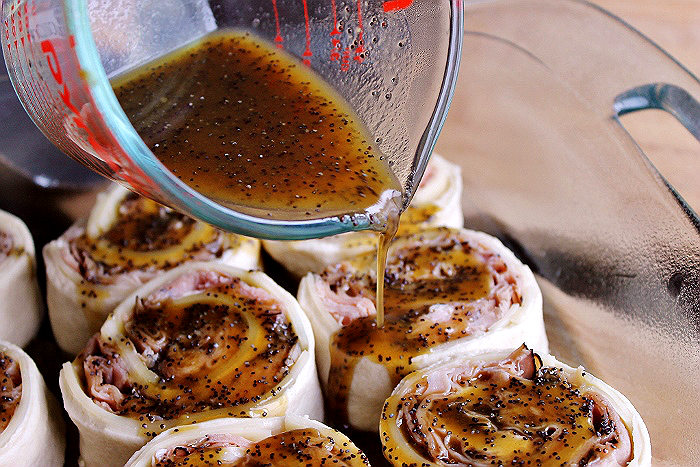 The real magic to this recipe happens when you make the extra special glaze with Worcestershire Sauce, Butter, Dijon Mustard, Brown Sugar, and Poppy Seeds. 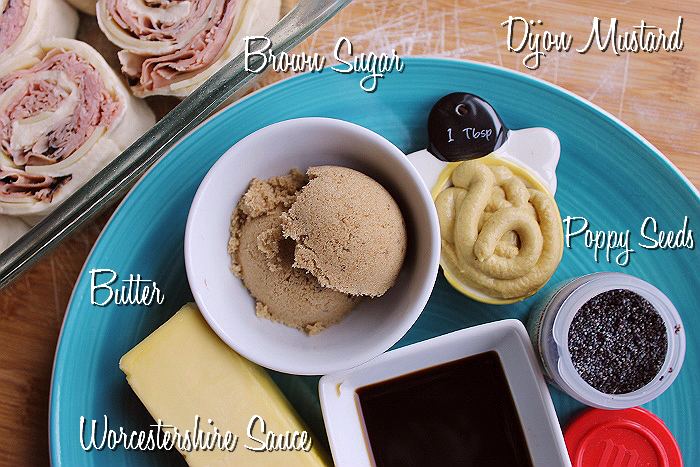 Melt them together in a microwave safe measuring cup, stir well, and pour over the top of your prepared wheels. Let the glaze work it's way into the folds of the wheels and even pool down over the sides. Bake your Ham + Cheese Wheels in the oven for 20 MINS, or until the tops begin to turn a golden brown. We like our 'crust' a little chewy, don't be afraid to go extra golden for that flaky dough! Not only do these Ham + Cheese Wheels look have a gourmet appearance, but they're incredibly easy to make ahead and freeze. One recipe's worth serves the two of us for several lunches when refrigerated, or they may be frozen after cooking and thawed at a later time. I would even wager that these would taste delicious over an egg with a cup of coffee the first thing in the morning. The possibilities are endless but your taste buds will thank you! What Daughter Says: Flawless food doesn't have to take 5 hours. 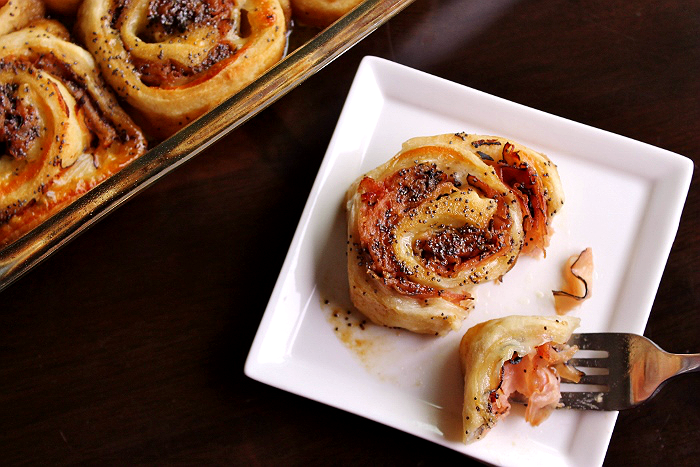 ***Click here for printable Baked Ham + Cheese Wheels Recipe. 1. Prepare a 9x13" baking dish with cooking spray. 2. Unroll the pizza dough onto a cutting board and gently roll/press into an approximately 13 x 18" shape. Layer cheese slices side by side, slightly overlapping. 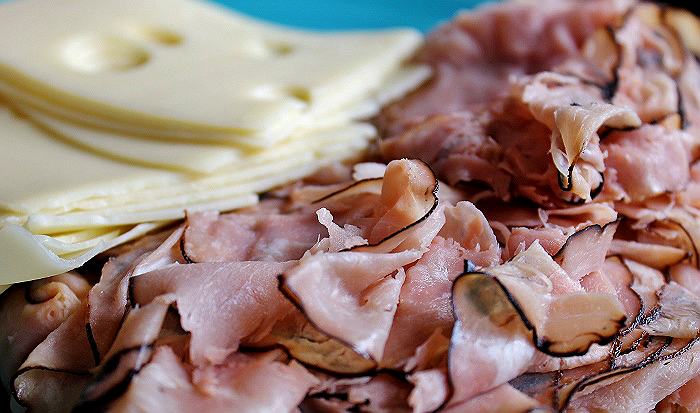 Place an even layer of ham atop cheese slices. 3. Beginning with the longer side of the rectangle roll up to the edge, tightly. Gently pinch the seam of the dough together at flap. Cut into approximately 12 1.5" slices and place wheels side by side in prepared baking dish. 4. Melt butter in the microwave within a microwave safe container. Add brown sugar, Worcestershire, mustard, and poppy seeds and combine well. Pour glaze evenly over wheels. 5. Bake at 350F for 20-25 MINS or until tops have reached desired golden color. I'd love these for breakfast!! My husband won't eat anything with mustard -- do you have any suggestions to substitute for the dijon? Hi Dede! The Dijon really is only there for an emulsifier, and just a tablespoon, so you will not taste it over the sugar and Worcestershire. If he is just THAT good at detecting it, or allergic, I suggest 1 egg yolk and a 1/2 TBS white wine vinegar. They look like so much fun. I love any kind of roll up - the creative possibilities are endless. These would make fantastic appetizers for a party. I'm sure they'd get gobbled up. These look absolutely delicious. What a great party dish! This looks so delicious....and that sauce!!! Mmmmm. Oh my goodness. You just gave me a great idea for breakfast in the morning. Yummy! These look so yummy! My husband loves ham and cheese anything, I will have to make these soon! You can bet I pinned this one! Anything I can Freeze it's right up my alley along with something that makes a great appetizer. I can see these in a mini-version. Want to make these for our super bowl party. They look amazing! Mmmm, these are super genius. 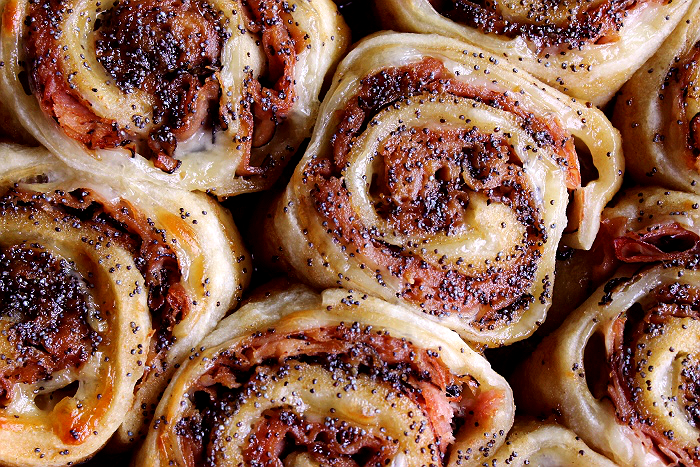 I love that you added poppy seeds, the pinwheels look delectable.